Wild Atlantic Way, Day Two: — Baydream Co.
Today we got up and had our breakfast at around 8:30am. 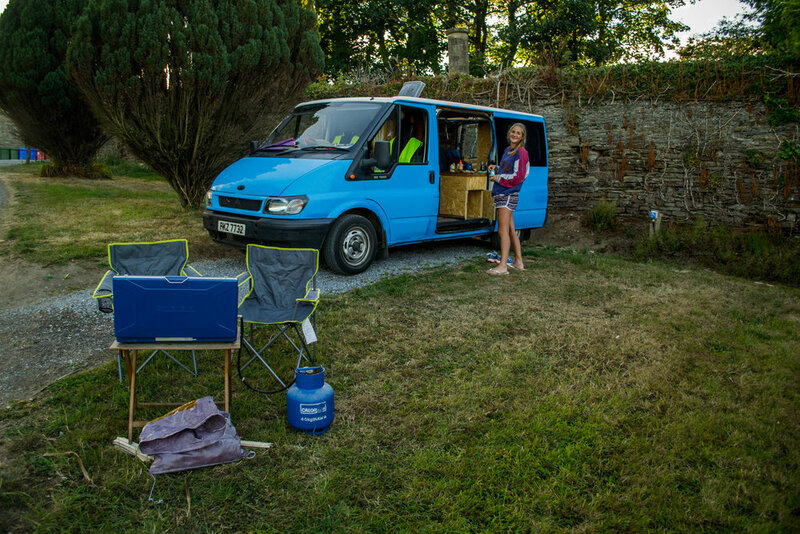 We packed up the van and got showered before leaving Roundwood campsite, then we were ready to embark on the next leg of our journey that would take us to Kinsale. Rather than taking the direct route, we started the day off by visiting Glendalough- the drive took us up into the Wicklow mountains were we found a lake in a spectacular valley with the mountains emerging all around. It seemed like there was plenty to do here, including a nice boarded walk that appeared to go around the lake, however after a quick stop to take some photographs we decided to keep moving. We then drove to Brittas Bay for a lunch stop, and we avoided a €4 parking charge by finding a parking bay about five minutes down to road from the main entrance to the beach. For lunch we had a baguette filled with salad and falafels along with some tea and coffee. We really love how we are able to pull up anywhere on our route and have everything we need on board to make our lunch, or even just for a quick tea or coffee stop. We are only two days in but we think we could live in the van long term, there is just so much freedom that comes with the lifestyle. After lunch we took a walk along the beach and dipped our feet in the water (it was pretty cold), but after many long hot days building the van this was something we were really looking forward to. We then left the beach started our drive to Kinsale which was about a 4 hour drive. When we arrived we decided to look for a campsite for the night. Wwe found one close by called Garretstown house holiday park- the site was lovely and we would definitely visit here again.